← Could Frozen’s King And Queen Also Be Tarzan’s Parents? While looking for details to support the theory connecting Frozen‘s King and Queen to Tarzan‘s parents, I actually found more compelling evidence to suggest Tarzan‘s Jane is related to Belle. Not one to walk away from a good Disney theory, I thought it was worth presenting that evidence. In my Disney world article, I point out that a teapot looking like Mrs. Potts from Beauty and the Beast appears in Tarzan. That theory suggests its another symptom of Disney’s erratic magical characters, but what if it wasn’t? What if the tea-set Tarzan’s gorilla-friend Terk is drumming on is actually a centuries-old heirloom from the Porters’ noble past? In fact, it could be just one of the clues connecting Jane Porter to Belle from Beauty and the Beast. You see, cutlery isn’t the only thing Jane has inherited from her royal ancestor. The beauties and their hygienically-challenged beasts. It’s also interesting that we don’t have a surname for Belle or her father Maurice, and Belle goes on to marry Beast, whose popular name ‘Prince Adam’ isn’t even officially recognised. So how do you connect the daughter of an eccentric French inventor to the daughter of an eccentric British adventurer? Through an eccentric German Duke, of course. As commenter Kate O’Gara pointed out on The Tarzan Theory, Frozen‘s Duke of Weselton looks more than a little like Jane’s father, Professor Q. Porter. Balding is hereditary – the Duke’s fooling no-one. This is because he is the familial link that connects Beauty and the Beast and Tarzan. If we take an estimate from the original story’s publication (La Belle et la Bête in 1740), Beauty and the Beast‘s French setting is probably somewhere in the late to mid-1700s. Based on similar estimates, Frozen is likely set in the mid-1800s. However, Frozen‘s Duke is from a German town called Weselton. How can he be the grandson of a French prince? This family link would also explain why the Duke is so terrified of ‘sorcery’ and magical women with long fair hair. Because his grandfather was cursed by a blonde enchantress. Come to think of it, who is this ‘enchantress’? Clearly the legend of his grandfather falling afoul of a magical enchantress have been passed down in the Duke’s family (though sadly not accompanying the lesson about vanity – as proven by his poorly-attached toupee). Since the Duke is frozen out of all future trade with Arendelle at the end of the film, it’s possible he wouldn’t have been popular with his constituents on returning to Weasel Town. Maybe he would start looking for a change of scenery. He’s clearly a resourceful and adaptable businessman, and his family wouldn’t be strangers to change. The Duke seems like the kind of guy who knows a goldmine when he sees one. If he made it to Britain soon after the first Industrial Revolution, he would probably do pretty well for himself (and help his children to do so too). Well enough that his grandson went on to be a professor with the means to lead expeditions to the African continent. Not filthy rich, by any means, but rich enough to be well spoken (that German accent would grow unpopular in pre-World War I Britain) and hold on to a few heirloom tea-sets. And having come from a family that had yo-yo’d between rags and riches across Europe, you can bet his descendants would be adventurous, adaptable and able to understand people who don’t necessarily speak their language. Jane is Belle’s great, great, great, grand-daughter. But the family tree doesn’t end there! Because in The Disney Theory I explain that Professor Q Porter possessing a toy of Little Brother from Mulan proves that his family went on to make the fictional movies of the Disneyverse (Snow White and the Seven Dwarfs, Dumbo, Mulan). In Tarzan we actually see that Professor Q Porter owns the equipment of early cinema. This entry was posted in The Disney Theories and tagged Beauty and the Beast, Disney, Frozen, Head Canons, Movies, Tarzan, Theories. Bookmark the permalink. This totally makes sense! I’ve always wondered how Mrs. Potts ended up in Tarzan, It also makes since how Tarzan might be Elsa and Anna’s little brother. So Tarzan represents Beast’s family finally forgiving the Enchantress’s for cursing Prince Adam (assuming the enchantress is in fact a relative of Elsa’s)? Or… Maybe the Potters did inherit a tea set from their French princely ancestors, that Belle and Adam had made to look just like Mrs Potts and Chip had done? No. If this theory is right than it disproves Tarzan as Elsa’s little brother because Weselton is the great grandfather of Jane, so the timeline wouldn’t add up. This is a good theory, but according to the book Tarzan’s parents died in a plane crash. Disney screwed this up. Besides, in Disney, the boat burned. not got caught in a storm and just sunk. Tarzan’s parents ship got struck by lightning, burning right off the coast of Africa. It’s just an “easter egg”. It’s not really Mrs. Potts. Mrs. Potts turned back into a human at the end of the movie. It’s just a tea set that resembles her. To make the audience think of Beauty and the Beast. It’s not supposed to be some sort of clue as to how they’re all related. Do you think this blonde enchantress could be related to Elsa somehow, maybe a great grandmother or an great aunt through her mother’s side? I also wonder if the enchantress has any connection to Cinderella’s fairy god-mother, their wands are very similar, perhaps it could be fairy god-mother, when she was younger. What if Cinderella’s fairy godmother is Elsa’s great grandmother or something? Also what if Rapunzel’s mother Gothel was really Snow White’s evil step-mother, they both turn into old ugly ladies lol. I bet that the enchantress belongs in the family tree of Elsa.Notice she’s blonde, and in a past theory,the powers run only in blonde members of the family,(Hence why Auna doesn’t have any,but Elsa does).And that theory is likely true.Notice how Elsa’s dad handles her problems so well.Hes blonde.Maybe he has some experience with these problems.You never know.He knows just what would help.Maybe its his fault the powers got passed down in genetics,and to Elsa and not Auna.Notice he knows ‘just where to go’.I rest my case.Theory APPROVED! But.. How could the pot and cups be there??? I thought the curse was broken, meaning Mrs. Pots turned back into a human again together with her kids… Maybe there is no connection to them at all? I believe at the end of Beauty and the Beast, Mrs. Pots still had that tea set. She was handling it during the time of the curse and transformed into it. That is my theory. I was thinking that maybe the reason the tea set lasted so long was because it was made more durable because of its experience with the magic. Like, there is still some remnant left because it was so directly exposed? I don’t know, it sounds kind of crazy. Maybe her soul went into it during the curse, then came out when the curse was broken? I don’t know. Everything in the castle pretty much is a talking whatever-it-is. So, the curse is broken and suddenly the castle has nothing? I think that the items were already there, the Enchantress casts her spell and everyone’s minds are put into items. Get what I’m saying? Also, is it possible that the Enchantress is a young Fauna? Fauna wears green, uses a wand, and they called Aurora Briar ROSE in Sleeping Beauty. What doesn’t go with my theory is that Fauna has wings and the Enchantress doesn’t. I think it’s possible she could have made the wings for herself since she did have magic. The tea pot and cups would be there after the curse broke becuase the curse changed the people of the castle into the objects in the castle. So the objects there prior to the curse would return to their original state after the curse broke. where does it say that they are turned into objects from the castle?? cos iv watched it a million times and must’ve missed that bit…. There is one thing here that blows a hole in one disney conspiracy theory. The fact that jane, belle etc is related to the duke from frozen and tarzan is the qieen and queen from frozens child. He would be an old man by the time he met jane if not even possibly passed away already. Their time periods are different though. Wasn’t Frozen around the vikings or maybe Renaissance timing while Tarzan was during the World Wars in the 20th century? They can’t be his sister’s cause Tarzan came out before th dumb movie frozen. Also their parents don’t look nothing like the parents in the movie Tarzan.I get the tangled and frozen theory.Not the mermaids theory cause once again It came out before them.If these were in a different time period I would have believed it. What i think is that when the frozen parents went on the ship it crashed. Which is the same ship ariel finds in her movie. But, while on the ship she ends up being pregnant with tarzan. When the ship wreck happens they escape and she gives birth to tarazan. what if jane and belle are cousins and weaselton duke, jane’s dad and belle’s dad are brothers. Impossible. The time periods are too different. The Duke of Weselton’s accent is not German, it’s English. We’re meant to think the film has the traditional imperialist despotic English villain, but it’s actually the charming all-American Hans, and the Duke of Weselton is just comic relief. Very clever, but still mocking the English; the ‘French’ and ‘Spanish’ and even ‘Irish’ trade partners are the good guys, and at the end when Elsa thaws the snow, all the visiting noblemen are visible except Weselton. How did you bring America into this Mel, its not pocahontas. Has it been mentioned that the Beast (as a human) and Tarzan look very similar? I find it interesting that brave is hardly brought up. Not sure of the actual time frame of which it should take place, but I feel it would be a time period before most of the stories brought up and could possibly contribute to the gene of red hair as it is not a dominate gene but is seen often enough in most of these Disney movies. Also geographically speaking, there isn’t much distance between most of these points of royalty. Brave is Pixar, not Disney. This website is Disney theory. Disney and Pixar collaborate, but they are two different production studios. No. Disney bought Pixar ages ago… most fans keep the two sets of movies separate anyways. Too different. There is a theory on brave being connected with monsters ink. Its very interesting..they say the witch from brave is boo from monsters ink looking for Kitty and Mike wazaskie. This can be true because of the fact she has a lot of bear things in her shop. Since when is the Duke German? He has an English accent, not a German one. Weaslton sounds far more English than it does German. To explain for the now faceless tea collection, maybe once Prince Adam (the beast) and Belle died, the tea collection, and everything (or should I say, everyone) else that was turned into an item, turned back into that item. Anyone else notice that the wardrobe in Anna’s room looks like the one in Belle’s in Beauty and The Beast? No, the tea set simply went back to it’s original, non-magical state. There is no proof that the tea set disappears actually. Yes they turned back into people but maybe they had the tea set before the curse happened. Also If you think about it, Belle had a love for books and stories and was viewed as kind of crazy like her father because of it. And in Tarzan jane tries to explain, quite dramatically, of the monkeys and seeing Tarzan, to which her father states something along the lines: she takes after her mother you know, she use to tell stories like that. Plus at Janes camp there is that huge pile of books that the gorillas are seen tearing up. Could those possible be Janes so she has plenty of adventure reading material while on the trip? So I would think Belle read to her children because she enjoyed books, which could very likely instill a love of books into her children who in turn did the same for their children. How would Tarzan be Elsa and Annas little brother though, he would be too old for one and two the theory doesn’t say anything about them it only talks about the Duke and his descendants. This theory ties Peter Pan into the Disney Theory. If the Duke of Weselton came to England during the Industrial Revolution, his grandson, Professor Porter, could have married Wendy from Peter Pan. But that’s not all, in the sequel to Peter Pan, Return to Neverland, Wendy’s daughter, Jane visits Neverland. This early experience may have instilled a spirit of adventure that inspired her trip to Africa. okay, one: Where did you get that? Boo has brown hair and Enchantress has blond and is a magical being. Brave is also Pixar……and the witch has aged so her hair would be blondey…and y does she have lots of carvings of Sulley on her wall and can open doors/portals like they do in monsters inc? She was also in Toy Story. Good point but the only problem with the duke being Jane’s father is that the duke is already pretty old maybe its his son or something?? Also the king and queen (frozen) have opposite hair colors than Tarzan’s parents. Maybe that’s what Disney wanted to happen i dunno. I just realized something; last night, I was telling this theory to my younger sister. When I mentioned the name Jane, she thought I meant Jane from Peter Pan. However, what if they’re the same person? Think about it; Jane from Peter Pan lived during the dawn of the British Industrial Revolution, & by the time Jane became an adult, the technology would probably be on par with the technology shown in Tarzan. Not only that, but it may show us why Jane is adventurous; when she was younger, she was taken to Neverland, which inspired her to go to the British colony in Africa later; she may have wanted to experience a new adventure. This can’t be correct since Jane from Peter Pan was young during WWII (1945-ish). Jane from Tarzan is a grown woman in the early 1900s. So your suggesting that the Duke of Weasel town is actually a time traveler? Do you think the blonde enchantress could be Tinkerbell? In the movie HOOK with Robin Williams (directed by Steven Spielberg but he worked with Disney and paramount), Tinkerbell is able to make herself human size to kiss Peter Pan. This could be her in human form? OR maybe its the Witch of the South from Wizard of Oz? Since she looks similar to Glinda the witch of the North but wears green. The Witch of the East was wicked and probably wore black and had dark hair. Just some theories, what do you think? Another thought with the witch theme…If this is the Witch of the South, then she could be Elsa’s grandmother? Since In the south you have Ice and Elsa’s dad/family carried the magic gene which is usually passed from mother’s to daughters, that might explain where she got her ice powers!? I feel that Hook and all those other titles aren’t cannon, I think that the only cannon things to use in this theory is Disney animated movies, not Pixar, that’s a whole other can of worms, but an awesome one at that, search this theory up on the supercarlinbrothers channel they’ll explain it a little more in depth. Back on topic Pixar and live action movies I feel are just not cannon. Thx for hearing me out, again check out supercarlinbrothers. I think that THE ENCHANTRESS from Beauty and the Beast is related to ELSA from Frozen. I don’t have much evidence to support this cause other than the fact that Elsa and The enchantress are both magic. This theory is really good and well thought out but you’re completely ignoring the end of beauty and the beast. there are two explanations why Mrs pots and chip are in Tarzan, one, it’s a witty Easter egg put in by the Disney team who wrote and produced Tarzan, and two that it is in actual fact Mrs pots and chip as well as the rest of the tea set from beauty and the beast handed down to Jane, belle’s great great great granddaughter. If the first theory is true then that’s that, but if the second theory is true then the explanation is a little more disturbing. at the end of Beauty and Beast everyone is turned back into their human forms because the beast aka prince Adam was able to get someone aka belle to fall in love with him, but if the tea set in Tarzan is Mrs pots and chip, which it does look like because of the distinctive chip in one of the cups in the set that leads to, surprise, chip getting his name, then this means that the spell the blonde enchantress cast wasn’t broken, meaning that the beast died, belle moved on or was maybe forced to marry Gaston to once again save her father, and the staff were left to live out the rest of their days as household objects. And if the beast and belle didn’t break the curse then prince Adam died which means they couldn’t have gotten married, had any children which eventually would lead the Jane theory. If this is true then this is where it gets weird. The curse cast by the blonde enchantress stated that if Adam couldn’t get someone to fall in love with him by the last petal falling on his 21st birthday then he would remain a beast forever, in turn meaning that all his staff would remain objects forever. now the curse wasn’t broken so everyone stayed objects, but the curse states that they would remain in these forms (as objects or a beast) forever, not that they would live forever, and considering Jane is meant to be at least three or four generations on from belle and Adam, if the second theory is true and they are in fact the original tea set, then in Tarzan, you are seeing the dead remains of Mrs pots, chip and whoever else was that tea set. Meaning Jane just happened to buy or acquire the literal undecomposed skeletons of the beloved characters from beauty and the beast. I don’t know about you but I would rather chose theory one, its less gross. Are the people on this site serious? I honestly can’t tell if you’re all being serious or taking the piss. You all know Tarzan is based on the novels by Edgar Rice Burroughs, right? And that his characters sure as hell have absolutely nothing to do with Disney, right? 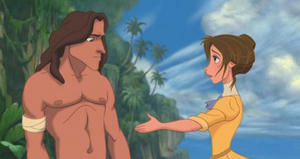 This is probably really strange but is Clayton from Tarzan the same person as gaston from beauty and the beast. There both good with guns. They hate Tarzan and the beast. They both dress the same and they kind of look the same. Could it be possible for the castle in Tangled be the same as in Beauty and the Beast but in the future? I noticed several things, for instance the town looks simliar, the bar in tangled is simliar to the one in Beauty and beast the fire place the horns on the chair . The castles themselves and the scene in which Rapunzel is reading a book with flin is simliar to the book store Belle goes to. They are not the same but why so similar? uh no these theories are completely wrong. disney characters look so similar because duh they have the same artists or same type of artist. seriously most of disneys stories are from grim tales or other old fairy tales so no no one is related because they are magical or have blonde hair. give me a break. All this makes sense but mrs potts and chip turn back into humans at the end of beauty and the beast….??? So how can they be passed down as pots if they are human?? I just realized you asked the same thing I did. I agree. They wouldn’t still be tea sets if they were reverted back to humans when Belle broke the curse. If the tea set is a regular tea set in Tarzan, is it possible that Mrs. Potts, Chip, and everyone else in the castle staff turned into objects around the castle. But when they turn back into people at the end of Beauty and the Beast are the objects they turned into still around the castle making it a possible heirloom? My 16 yr old brought this up when we were discussing the connections and she got me thinking on this. How could that be Belle’s tea set if Belle released the curse when she fell in love with the beast and Chip Potts and his mama turned back into humans? It wouldn’t make any sense then if they were still tea sets in the future. No, but it was a nice tea set. Maybe Belle and Adam had a set made to look like them. To all you talkng about how Elsa got her magic: Traditionally, the first-born of every royal family in many stories will have some kind of magical abilities. As we see in Once Upon A Time, Elsa and Anna’s Aunt had Ice Powers, and was THE QUEENS SISTER, NOT THE KINGS. (This woman was the first born and was meant to be queen, but gave it up for fear she could not rule a kingdom with her powers) This proves that magic runs on the Queens side of the family. 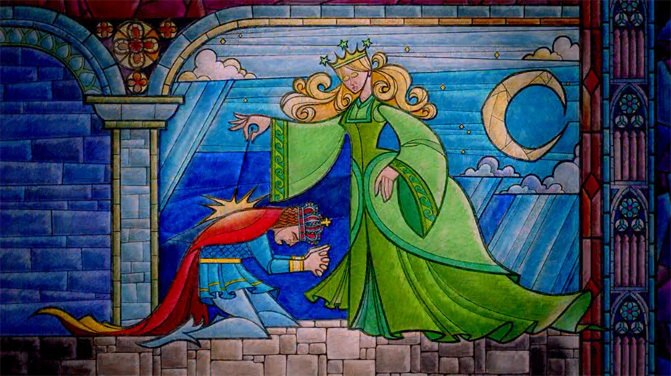 The reason the King knows what to do is because he feared Elsa would have powers, and his neice Rapunzel had once been stolen away for her powers, so he was prepared. He had dealt with this sort of thing before with his sisters-in-law and knew where to go. I still think Rapunzels mom is the King of Arendelles sister, but Rapunzels Magic was not genetic, it came from a magic flower, so the cousins both having Magics entirely coincidental. And Princesses Eilonwy from The Black Cauldron, with her light ball was Elsa’s ancestor ? It’s a possibility also that Eilonwy is the Enchantress herself or her ancestor ? It inducted that Maleficent because of his Hornes is the Horned King’s daughter or descendant. This last is also a descendant to Chernabog. I notice also ressemblances concerning King Hubert and The King from Cinderella ? There is a link ? You people overthink things too much. It’s just a hidden joke by the animators. Well, no durr. But where is the fun in that? Why do you think these are called theories? Plus, it adds to the fun of Disney movies. Sure, it’s fun to watch, but it’s more fun to take a look behind the scenes and possibly uncover secrets. I’m pretty sure that Once Upon a Time isn’t canon. I believe that Tarzan is NOT the brother of Anna and Elsa. The time periods just do not match at all. However, the sunken ship in Ariel IS the ship that Anna and Elsa’s parents were traveling on to go to Rapunzel and Flynn’s wedding (a Disney exec. confirmed that the parents were definitely going to a wedding; I believe that Rapunzel is the cousin of Anna and Elsa (magic runs in the blondes in the family, and Rapunzel’s mother closely resembles the Frozen girls’ father; also, this explains the Easter egg appearance of R and F at Arendale). Geography is proof: Arendale is in Norway, Rapunzel’s kingdom is in Germany,and Ariel is between the two (Ariel story’s creator Hans Christian Anderson lived there and located story there). Ships look extremely similar, if not identical. Any differences can be located to rot. Now Jane may be or may not be the descendant of Belle; I don’t know. With the china, similar dresses, and love of books greatly suggests that they are kin somehow. Jane may be the same Jane from Peter Pan as the time periods match upbprettt well. No, the timelines for Jane of Peter Pan and Jane of Tarzan DO NOT match up well at all. Jane from Peter Pan was a child in WWII London. WWII was from 1939 to 1945! Jane from Tarzan was a grown woman in the early 1900s! Seriously, people. Rapunzel is brunette not blonde.. she got her “powers” because of the flower they used to save her mom when she was pregnant.. People think Rapunzel is related to Anna and Elsa but she might have just been invited because she was royalty. You are so right, but the fact still remains that Rapunzel mostly is blonde in merchandise and such. Is it just me, or does the sorceress resemble the Starbucks logo? I would say all the castle servants lost their human bodies to the Enchantress’ spell and their essences were trapped inside the household objects lying around the castle. That makes more sense when you consider why ALL the furniture, kitchenware, etc. was alive. Besides, if they all just transformed back from objects to human, Prince Adam would’ve had a lot a shopping to do to replace all that stuff. Once the spell was broken, all the spirits left the objects inanimate once more. Anyway, it’s pretty evident that it’s the same tea set in Tarzan. I mean, one of the cups is chipped. Hm, yeah, maybe that could be it. Another explanation for why a German duke would be in England is slightly more boring and involves actual history. We know from King James in Pocahontas that Disney uses real monarchs at least some of the time. After the House of Stuart that James hailed from came the House of Hanover starting with the 100% German George I. From George I onwards, the British royal family has essentially remained full blooded German and they had a habit of importing German wives, or in Queen Victoria’s case, a German husband. And since the royals did and do still inter-marry within the family again and again, everyone is a cousin of a cousin of a cousin. So a German duke would undoubtedly be related to the royal family of England and would have had every reason to settle in England as a “poor” royal relation after being disgraced in his own country. And his son or grandson visiting Africa with his daughter in tow makes perfect sense if Tarzan occurs within the late Victorian or early Edwardian era when exploring Egypt and other parts of Africa became very en vogue for the well to do. Theories are just ever so swell. Well I think this makes a lot of sense but I have one big question still. From what I understood, according to the disney theory, Beauty and the beast would have to take place BEFORE the hunchback of notre dame, but as said here The Beauty and The Beast takes place in the mid-1700. So far so good, but then is where the issue comes: The Hunchback Of Notre Dame takes place in 1482 Paris. So how could this work? Maurice managed to invent a time machine, which made it possible for Belle to go back in time. Well, According to research beauty and the beast is set in France, 1770s-1780s. Now in 1789-1799 was the French Revolution, And belle and Prince Adam were aristocrats and would’ve been executed. If they had’ re had any children in that time, They too would’ve been executed, and belle and Adam would definitely not have had any grandchildren. So you don’t believe that there is any way that they could have escaped? This idea is stupid because nothing in that china set has a face. It is not really Mrs Potts and her children, but it looks exactly like them. The theory is that Belle and Adam had a china set made, that looked just like Mrs Potts and Chip when they were under the spell.